They were a "team" of three, and one of them has just been in touch. I have permission to pass this on here - it describes a third program that wasn't released. wrote a couple of games for the TI-99/4 series of computers. Civil Engineer (road design) back in my working days. FFF Software was working on a third program when TI made its announcement. Dino Kong and it was to be sort of a Donkey Kong derivative. adding some bonus screens under certain circumstances memory permitting. time. Oh well, we cannot live in the past. I recently purchased a set of manuals for both of their released programs. I'm still in the process of getting them scanned. Are you the winner of this auction right ? Ooooh , the BAIT, the BAIT! Looking forward to both games and manuals! My name is Rick Rothstein and I was the programmer for FFF Software and thought I would stop by and say "Hi". Thanks to blackbox for posting the description I gave him offline of the "game that never was" which he included in the first message. We had had high hopes for the game up until TI pulled the plug on the home computer market. Hey ti99iuc... you kept our TI-Asteroids and Space Shuttle manuals in pretty nice shape there... kudos to you for being so protective of them. Any way, that is enough reminiscing for now. Take care all. Edited by RickRothstein, Wed Aug 10, 2016 11:52 AM. For anyone who has lost their typing skills, here is a disk with Jackpot on it - requires XB, the filename is jackpot. i am so happy you are present here ! thank you ! People are auctioning off FFF Software manuals? And people are bidding on them? Really? Do you remember how much they sold for? Looking forward to the PDF of these new manuals, I even have the appropriate colored paper for the covers standing by. 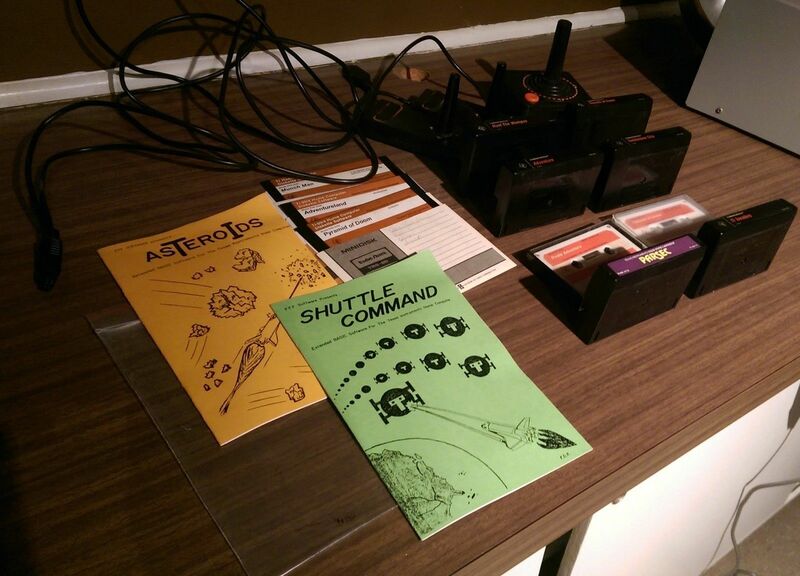 I'm also really looking forward to seeing this playable version of AsTeroIds. I've not yet seen a real nice port for the TI yet. I paid $45 (BIN with shipping) for the manuals and the other things in that lot--but my goal was the manuals, as I didn't have either of them. Nice to see you here Rick! A lot of retro-enthusiasts enjoy collecting original software manuals or keeping the ones we have in good condition. After all, they're a relic these days... most software doesn't even come with manuals at all. All of the Compute! books for the TI can be found here (along with many more). All of the Compute! books for the TI were also translated into Argentine Spanish and sold there by Kapelusz publishing. I have a number of them in that version as well. $27 for the single manual?!!?!? You have got to be kidding. I still have a few originals of each of the manuals in my basement (some cassettes too, but I have no way to prove if they are still readable or not)... maybe I should put the manuals up for auction on ebay, hmm. Thanks for the info... very interesting... and surprising. All of the Compute! books for the TI can be found here (along with many more). Thanks for the link... I figured they had to be out there somewhere. There were two programs in the "Compute! 's TI Collection Volume Two" that I wrote which I think were pretty good (even if I have to say so myself )... Labyrinth on page 69 and BOG'L on page 82. BOG'L is an on-screen replacement for the 4x4 Boggle game you can purchase in any store (although they have changed the letter distribution on the dice several times across the years). Its "selling" feature is that the letters display randomly oriented like the real game as opposed to all upright like most similar type programs I have seen which tend to favor all letters displayed normal orientation. The Labyrinth program has an interesting history. When I first saw the program I modelled this after in the Compute magazine, there was no TI version of it, so I sat down and wrote one along with the article to accompany it. When I submitted it, they were a little surprised at how fast it was. Seems their resident programmer tried to write a TI version and it was so dog-slow that they decided not to print it. In later conversations, I found out why... the programmer tried to apply Commode, Atari and PC type graphic approaches to the TI... I catered the code to how the TI displayed graphics instead (redefined characters, then print those characters to the screen). Anyway, Labyrinth can be fun to play for a little while, but not for long continuous time periods. It is always a treasure and a blessing to have legacy programmers come and visit us here. As an XB game developer for the TI, I always love looking at old XB code for inspiration. The tools we have now at our disposal for creating TI programs are incredible, and with them, I have no doubt FFF would have made countless more games. Thanks for visiting... I hope you stick around for a bit. Thanks for the nice welcome. Things looked bleak for new programs when TI closed up its home computer division, as you can well imagine. The three of us who made up FFF Software all worked for the New Jersey Department of Transportation in the same office. I retired back in 2002 and Frank (our graphics man) retired a few years later... I stayed near my home town and Frank moved to another state and we lost touch after that. Flavian (our documentation man along with other activities related to fulfilling orders) moved to a different office and contact with him became sparse... eventually he moved out of the area without telling us where so I have no idea where he is anymore. So there won't be any possibility of FFF Software coming back together. An interesting story about the name FFF Software that we chose. No one wanted it, but after creating all the graphics for TI-Asteroids (our first game), there were exactly 8 undefined characters available so be able to display a company name.... Software has 8 characters and since the three of us had first names that start with the let F (my real first name is Frederick, Rick is only a nickname), I took the F from the word software and tripled it to make FFF Software. After that, every possible character in the Extended Basic character set had its "shape" redefined. I've often wondered what kind of people made up the various small-scale software companies that produced tape and disk games for the TI-99/4a back in the days... Check out my "Wizard's Doom" thread under development for my musings on Rainbow software. We don't even know the names of anyone who worked there, just an address in Brooklyn, NY. One thing with the old Compute! magazines that impresses me is how much money was poured into them, particularly 1982-1984. They had FULL color page ads for software liberally throughout the magazine. It's clear that at its height prior the the crash of '83, everyone thought there was money to be made in the home computer market. I had a subscription to Compute! from 1986-1988 (Why I have no idea, they didn't have anything for the TI anymore, I think my parents thought it was useful) and the difference is stark; the ads became simple text and single color on every page. I took a quick look but couldn't find the "Wizard's Doom" thread.... can you post a link to the thread? Yeah, Compute! got pretty jazzy there in the early '80s... I think their success back then was a result of everything being kind of new in the home computer market back then (you bought a computer and then learned to program it or else all you had was an really expensive game machine.. and TI did not have the best games available in those days) and they featured articles with program translations for multiple computers. They also spent a lot for articles as well... they paid me $650 for my #15 puzzle (but they really wanted that one... see my first message for details)... $450 for the article itself and another $200 to reserve the rights to be first to publish it on distributable media (tapes or floppy disks). That was a lot of money in 1983 (I think I paid $800 for my TI if I remember correctly). My second article did not fare as well... they only paid me $450 for it ($250 for the article and $200 for first media rights). And after that, they only paid me $250 for the remaining articles after that (they dropped the media rights payment when I guess they realized they were not going to publish them that way). Still, even with the declining payments, they were paying what I considered a huge amount of money in 1983 dollars. Okay, I just went through all of the command modules I own... anybody know if any of them are considered rare (I am guessing not)? Edited by RickRothstein, Thu Aug 11, 2016 10:41 PM. Minimem brings a penny or two on the Bay... Getting harder to find these days. Your versions of XB interest me... Is it a label variation as well as system variation? Thanks... I'll have to see what the Minimem is bringing now-a-days as I have no use for it. As for the Extended Basic... these are the first two Extended Basic modules that were released... the first when the 99/4 was out (that was the first TI that I owned) and then when the 99/4a was released (my second TI)... at least that is how I remember it. I also think the second one contained some kind of bug fixes as well. Both modules are black and the copyright date on them is 1980 and they have the same PHM number as well (although the font used to display the PHM number on the older version is about half the size of the second one). It was necessary to keep both of them as they executed programs differently time-wise.... when setting internal timings within loops, it was necessary to eat up more loops with one over the other, for example, to make the 3 minute time built into my BOG'L game (sold to Compute! magazine) actually take 3 minutes. I have both the original versions of XB. Version 100 was quite rare, and sold very few copies- it was the first version ever of XB, was issued for use with the TI99/4, and had several bugs. One major flaw was that it would always monitor all the sprites even when you were only using one, which slowed things down. Version 110 was modified to only monitor the sprites in use, and to work better with the TI99/4a. There were several other fixes. The first Extended Basic was issued quite some time after the 99/4 hit the market. My version 100 module, which was one of the very first sold in the UK (I ordered it and paid for it months in advance) has a serial number of LTA 1581 indicating assembly in week 15 of 1981. Obviously the next version returned a value of 110 to the version variable. Much worse (I sold US written games in the UK) was the difference in sprite speeds between UK and US consoles as the sprite speed was tied to the screen refresh rate (think 50Hz and 60Hz), and inevitably Extended Basic programs required modification for the UK market. Usually machine code programs required no modification due to the differing structures, which made it easy for TI to produce just the one module for both markets.